In the evening we had the monthly meeting of our men’s group. Although we had been meeting for a couple of years, there was a moving of the Spirit which prompted some men to witness to the power of God in their lives. It felt as though the time had come for the group to move deeper into the Faith and to share it with others in new ways. It was a refreshing and encouraging meeting. 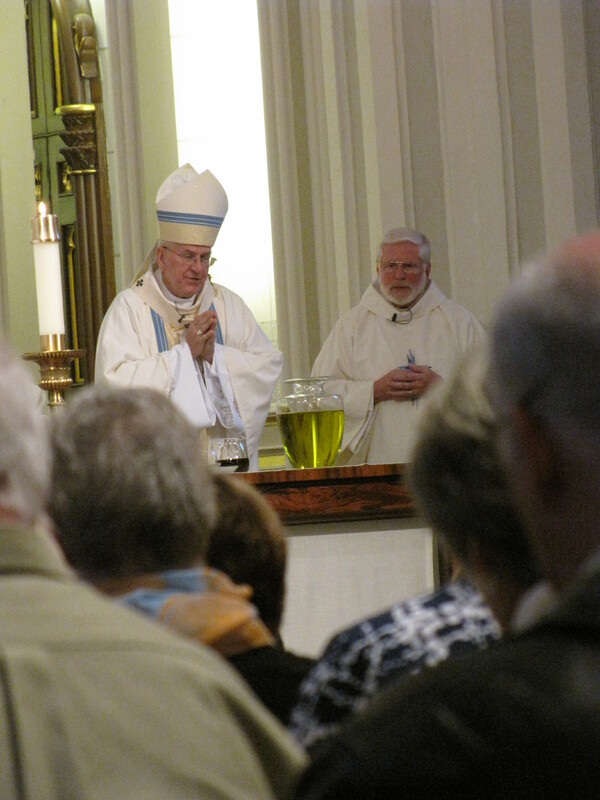 We went to the Chrism Mass at the cathedral and experienced the blessing of the holy oils. 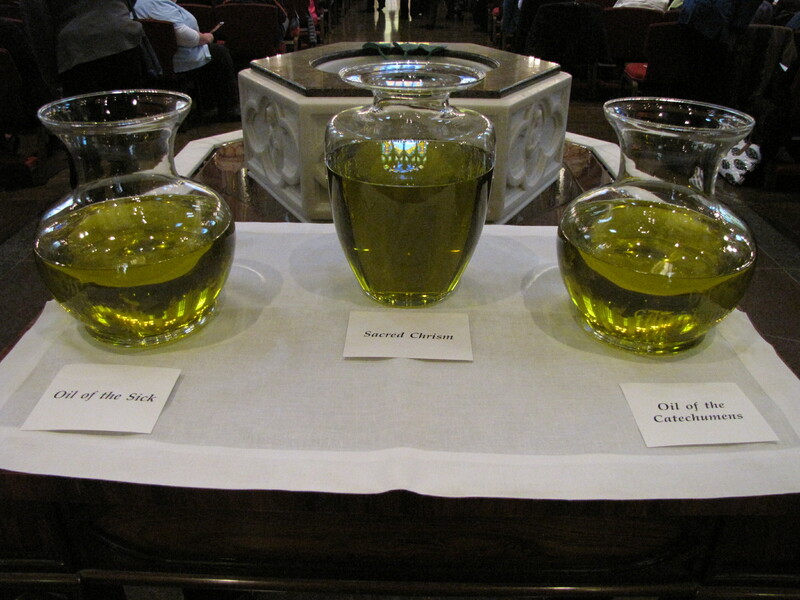 The oils are distributed to parishes throughout the archdiocese for use in the sacramental life of the Church. Each church has a special place to keep and display the holy oils. Also, during the Mass, priests from around the diocese renewed their commitment to their vocation, and the congregation warmly acknowledged several new seminarians preparing for the priesthood. As the liturgy engaged all five senses, I was reminded that, unlike the angels, God gave us physical bodies for a reason. God came to us physically 2000 years ago, and he still does today in the Eucharist. It was true worship. The foot washing Mass commemorated the humble and loving example that Jesus showed His disciples by lowering Himself to the place of a servant and washing their feet. The priest knelt to wash the feet of twelve members of the congregation (one of which was my wife). It was a moving display of God’s love for us, and the attitude Christians must have towards others. On Good Friday we gathered with soberness of heart while meditating on the depths to which Christ lowered Himself for our sake. Each of us went forward to venerate the cross. At the foot of the cross, we showed respect and gratitude for the price Jesus paid for our sins. It is always a moving experience. 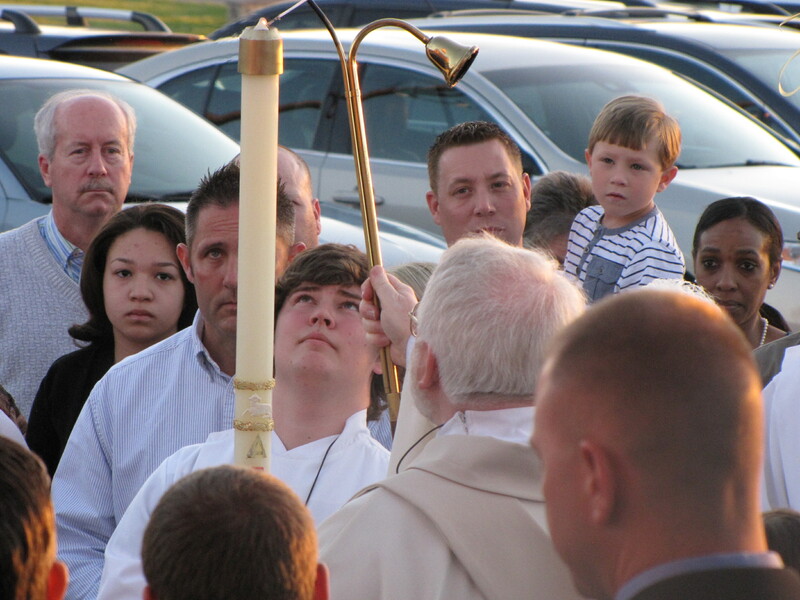 The Rite of Christian Initiation of Adults (RCIA) is approximately a nine month process in which people wishing to become Catholic Christians are catechized and brought into the Church community. It is not a quick process, because the Church regards being Christian a very serious matter. The Church also recognizes that conversion is not a one-time event, but a life-long process of growth, learning and discipleship. Being Christian is about a relationship with Christ, and a relationship with Christ is fully realized and expressed within the context of knowing Christ’s Church. 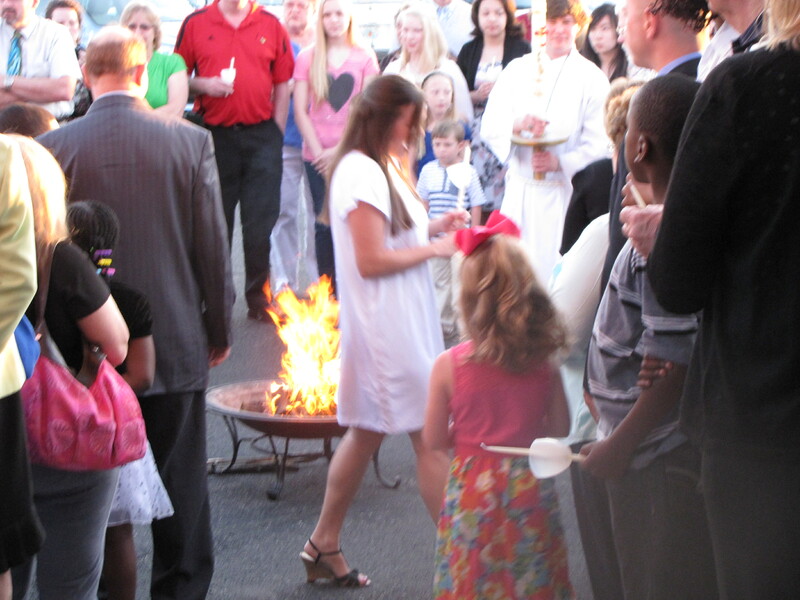 Those in RCIA finally enter full communion with the Church during the Easter Vigil. It begins with the blessing and lighting of the Paschal candle outside the church at a small bonfire with everyone gathered around. 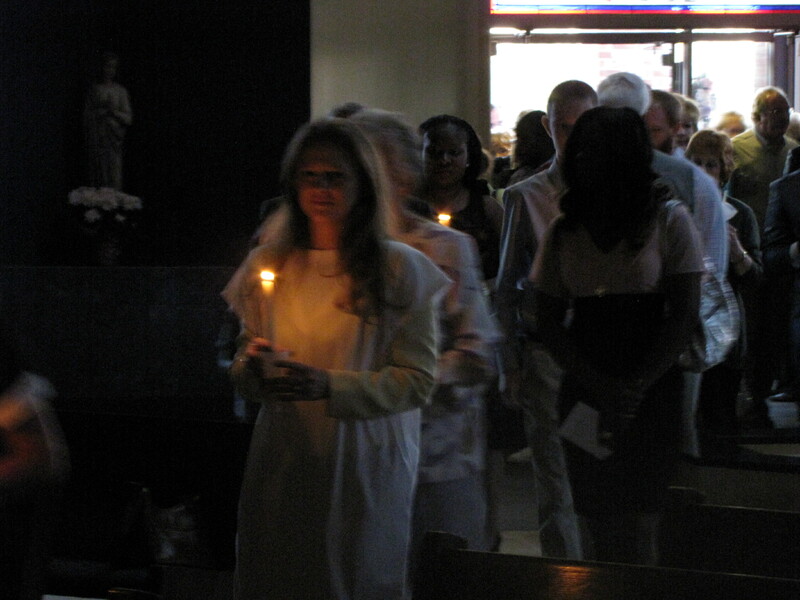 From there, we enter the church in a candlelight procession. As the service progresses, the music becomes more celebratory and the lights become brighter. The crucifix has been replaced by the image of the risen Lord. We are ushering in Easter, the resurrection of the Lord! Death is swallowed up in victory! 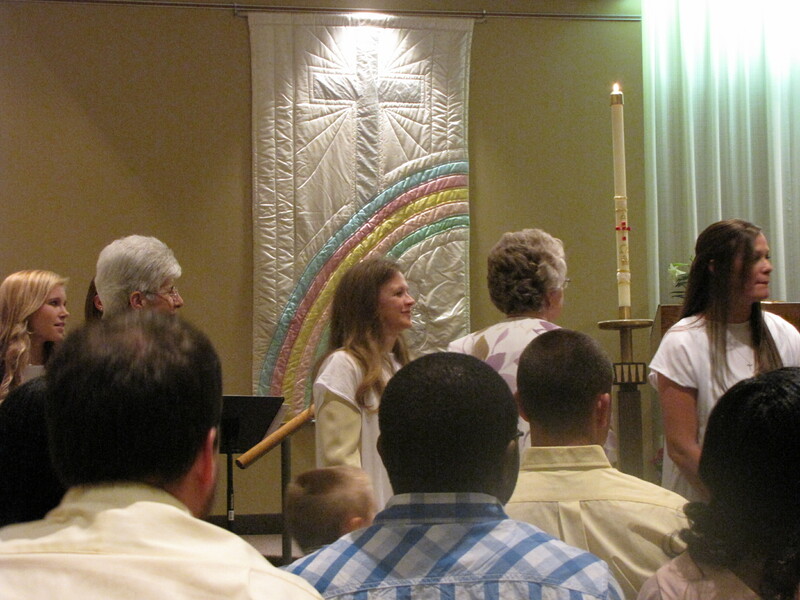 Catechumens (those who are not yet Christian) receive the Sacraments of Baptism, Confirmation and Holy Communion. Candidates (those who are already Christian by virtue of their baptism in other denominations) receive the sacraments of Confirmation and Holy Communion. 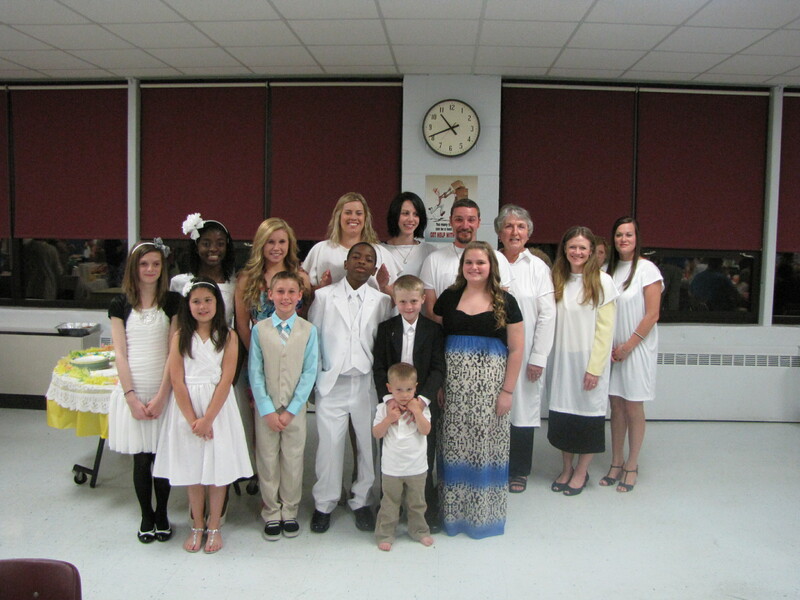 We welcomed all of them with open arms as they entered into the fullness of the Christian Faith! 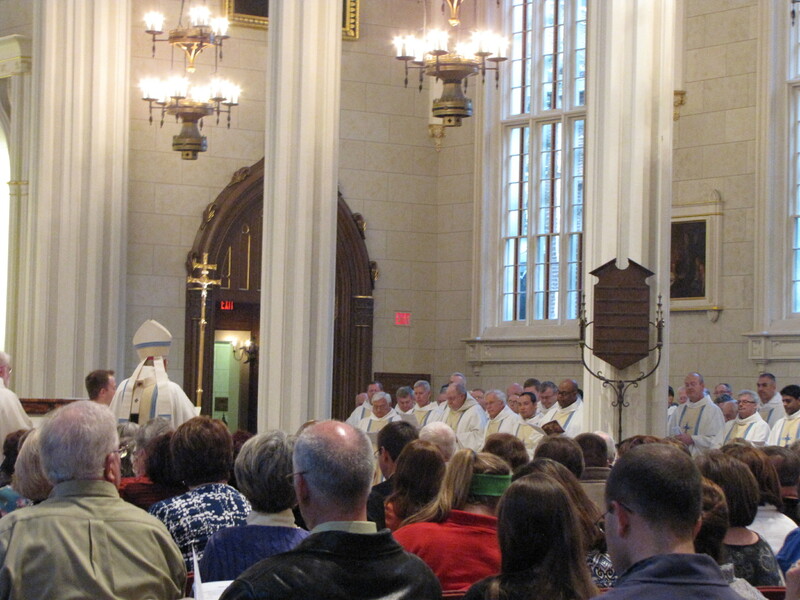 Our parish had about 15 of the over 400 hundred people entering the Church all over the diocese. One of the women that became Catholic this Easter spent more than the prescribed nine months preparing. 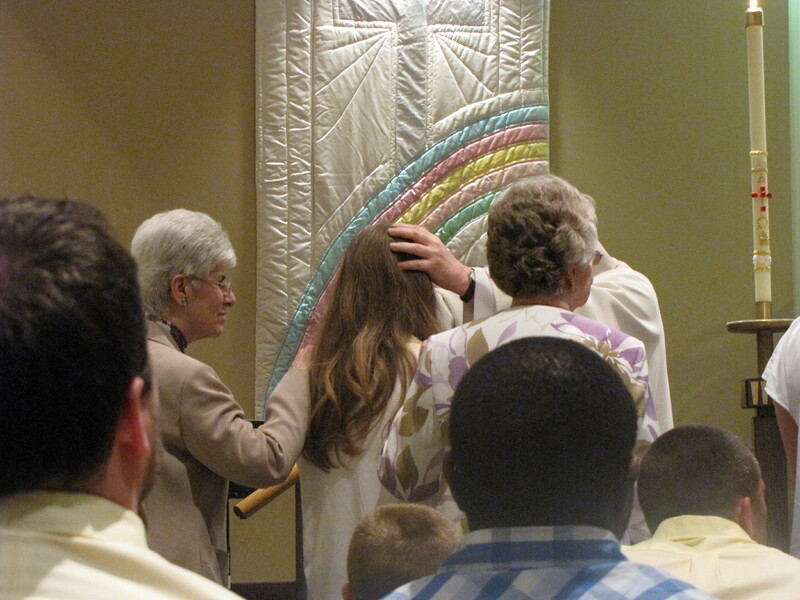 She had been through the customary RCIA period, but, at the end, was not ready to commit. She still had much to process in her mind and in her heart. She had always been a strong, faithful Christian. She had a lifelong relationship with Christ and a strong foundation in scripture. She took very seriously the implications of embracing Catholicism. Nine months of study and discernment turned into four years. No one pressured her to become Catholic. They simply loved her, answered her questions as best they could, and gave her the space she needed. The Holy Spirit did the rest, as only He can. At the beginning of Lent, this woman (my wife, if you haven’t already guessed) approached me, pulled me aside and said, “I have something to tell you. I’ve decided to enter the Church this Easter!” My joy was increased in knowing that she had reached this decision in her own time, gently led by the Spirit of God who loves her. My respect for her increased in knowing the courage it took for her to make this journey and that her decision had not been made lightly. The years it took for her to step out in faith made it all the more inspiring to me and to many of those present Saturday night. I am so grateful for how she has been led by the Spirit and embraced by the Church community. Only she can tell her story. I do know there are things she is still pondering and learning about, but that is what we all must do. No one “knows it all.” Conversion is a life-long process. Christians are called to discipleship, which means we are to be constantly learning from the Master through His Church. However, we can’t wait until we have every question answered before acting on faith. St. Augustine said, “If you understand, then it is not God.” We can’t intellectually grasp all the wonders of God. We must take some things on faith. That’s what makes it faith. By faith, my wife had already accepted the salvation offered through her Lord, Jesus Christ. Now, by faith, she has embraced the Church established by that same Lord, Jesus Christ. My wife and I have always had a wonderful relationship. Now our union has reached another level of intimacy with God and with each other. The journey holds new possibilities as our path unfolds before us, God’s lamp lighting our way. My little nephew announced that he had decided to follow Jesus. His journey has begun with the childlike faith Jesus calls all of us to have in Him. Now you know why this has been the best Holy Week I have ever experienced! Glory be to the Father, to the Son, and to the Holy Spirit, as it was in the beginning, now, and will be forever. Amen! This entry was posted in Catholic, Catholicism, Christian, Christianity, Church, Conversion, Easter, Holy Week and tagged Catholic, Catholic Christians, Catholicism, Christian, Christianity, Church, Conversion, Easter Vigil, Holy Week, RCIA on April 21, 2014 by Thomas. Thanks so much, Pat, for all your prayers and support! We love you! It was beautiful to see Susan at the Vigil I told her at the reception that she was now my little sister in Christ As far as the MOEA meeting it was the best ever. You encouraged me to tell my story which I should hare done sooner I felt that we all became closer that night Thank you for that. Jim, thanks for being willing to share your story. We all become richer when we hear how God works in people’s lives. Looking forward to the next meeting!